NWSL Roundup: Key addition and activation from NWSL injury report; Utah Royals FC sign E.J. Proctor. Mallory Pugh out with knee injury, Yuri Kawamara activated from disabled list and EJ Proctor signed as a replacement player for Utah Royals FC. Washington Spirit and US Women’s National Team forward Mallory Pugh will possibly be out a few weeks with a right knee injury. The injury occurred near the end of the match against the Houston Dash on May 27th. Pugh will undergo more testing to determine the severity of the injury. U.S Soccer medical staff will work together with the Washington Spirit medical staff to evaluate the knee injury. Pugh was not called up to the USWNT roster against China PR due to the injury. Also, Puge will not play in this Saturday’s home game against the Chicago Red Stars. Pugh has registered two goals on eight shots on goal with one assist in 10 appearances this season. Washington Spirit are currently eighth in the NWSL table with a record of 2-6-2. The Spirit will host the Chicago Red Stars this Saturday in NWSL game of the week. The match can be seen on Lifetime Saturday, at 3:30 PM EST. 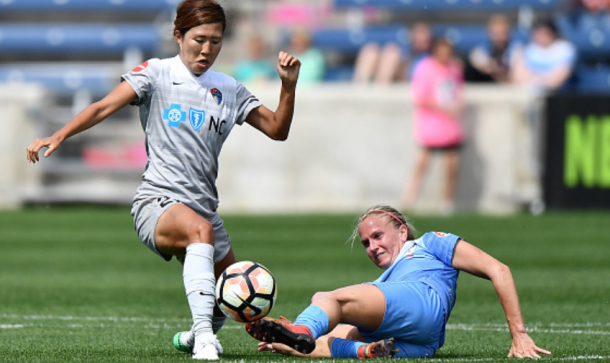 North Carolina Courage and Japanese International Yuri Kawamura was activated off the injury list Thursday. Kawamura tore her right ACL and meniscus against the Chicago Red Stars on May 27, 2017 that required season ending surgery. Before the injury, Kawamura appeared in eight games for the Courage. At the start of this season, Kawamura was placed on the 45-day disabled list to recover from the surgery. Kawamura has two goals in 32 appearances for the Japanese National Team. The undefeated North Carolina Courage travel to Houston Dash Sunday, June 3 at 7:00PM EST. Goalkeeper E.J. (Emma Jane) Proctor was signed by Utah Royals FC as a replacement player for the match against Sky Blue FC. Head Coach Laura Harvey announced the signing after starting goalkeeper Abby Smith was called up to the USWNT roster friendlies against China PR. The 2018 NWSL College Draft second round draft pick by the Royals FC 34th overall. Proctor played for Duke University with a 50-15-9 overall record with 35 shutouts. In her senior season she recorded a record of 21-2-1 with 14 shutouts. Utah Royals FC travel to Sky Blue FC Saturday, June 2 at 7:00 EST.